For those not in the know, the original Leis of Jazz was released by the legendary exotica artist Arthur Lyman back in 1959. 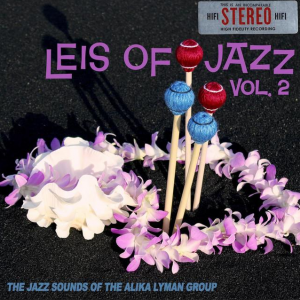 Leis of Jazz, Vol. 2 is the creation of his great nephew Alika. I can’t claim to have my finger on the pulse of the exotica community, but I think it’s safe to assume news of this release was probably first met with a mixture of interest and suspicion. It wouldn’t surprise me at all if some initially wrote the album off as a lazy cash grab from someone trying to make a career for themselves. But anyone who felt that way couldn’t have been more wrong! Alika Lyman has been honing his musical skills since middle school and has studied under accomplished professionals in order to expand his knowledge outside of his chosen instrument (the guitar), including none other than Randy “The Waitiki 7” Wong. If you can name the genre, he’s probably studied it. He also has enough experience to teach other budding musicians! After performing in numerous bands, Lyman formed his own in 2009 and released two albums in 2013: the band’s self-titled debut and a spin-off jazz/funk project called MANCHiLD3. It wasn’t until the following year that he decided to play tribute to his great uncle. Given his interest in jazz music, which goes back to his school days in Hawaii, such a project was only natural. Rather than just do covers of his famous relative’s standards, he has opted for a mix of original material and covers from a variety of sources. One such cover version is “Swingtime in Honolulu,” which features many of the instruments you’ll be becoming very familiar with over the course of the album. The sounds of clanking drumsticks open up a peppy world of cymbals, bongos, vibes and guitar work. Soft vibraphone work is the star of “Poinciana,” followed by the equally soft (but energetic) bongos and guiros. It’s incredibly relaxing and I was pleasantly surprised at just how well the guitar work blends in. “Night Orchid” brings us the bird calls and animal noises we expect from any exotica album. A steady bongo beat forms the backbone of this track, which is further enhances by dreamy chimes, maracas and some outstanding musical variations from the guitar and vibes. I love the bongo work of “Kauai Rose.” It all goes so well with the bird calls and quiet buildup of chimes and percussion. “Kaimana Hila” is bouncier than the other tracks, but admittedly not by much. But that should not be taken as a complaint. Although the guitar gets the spotlight here, there’s plenty of exotic percussion to go around. “Hukilau” is comprised of super soft cymbal strikes mingling with guitar work and stretches of vibes. It only sounds like there’s so much more thanks to the melody (and expert playing). I understand “Lei Kukui” is a traditional Hawaiian song for weddings and anniversaries and I can believe it thanks to the soft, soothing guitar work and vibes. As you might expect from the name, “Arthur’s Line” was a song written for (and performed by) Arthur Lyman. You’re sure to be in absolute awe over the guitar work here. But don’t let its presence make you think it still doesn’t retain the classic exotica feel, because that would be incredibly inaccurate. “Theme from ‘Bewitched'” is just what the title says. And you know what? The theme from Bewitched works surprisingly well as an exotica track. You would swear the song was originally written for the vibraphone. The performance really is that good. If a Tiki bar patron heard this without knowing what it was, it’s easy to imagine them puzzling over what exotica album they heard it on before the realization dawned on them. It also flows nicely into “Guiding Stars,” which is somewhat moody despite being laid back. guitar, cymbals, vibes. In contrast, “Bobo” is more energetic than last track and must be heard to be truly appreciated. “Hilo Hattie Blues” serves up quiet percussion and piano work (among other instruments). It’s a modern day original composition, but you’d swear it was an old standard. As much as I hated to hear it stop, I simply loved the closing. “Pua Lilia” means “the lily flower” and the music making it up is just as soft and gentle as the petals of the flower which inspired it. It’s the perfect close to the album. Alika Lyman has done his great uncle proud with this delightful album. Had I not used a streaming digital copy to write this review, I would have had access to the liner notes so I could properly praise the other performers. Perhaps those of you with copies of the CD or vinyl releases of this album could help me? Whoever they are, they all did an amazing job. I’m not the only one who feels that way. In addition to its widespread praise and positive reviews, it was nominated as “Best Jazz Album of 2015” at the prestigious Na Hoku Hanohano awards! After having listened to the original Leis of Jazz, I can safely say this second volume is a worthy follow up. Playing the two albums one after the other was quite interesting. The first volume seems more energetic and boisterous while this album was comparatively more mellow and dialed back on the use of piano work in favor of the guitar. However, the choices used for the other instruments matched up nicely. The original, like numerous other vintage exotica albums, has a little something extra which I can’t quite describe. But what I can say is Leis of Jazz, Vol. 2 has it too. The choices made by Alika Lyman Group shows their commitment to paying tribute without being a soulless imitation. This is also reflected by the album’s cover. It has enough similarities to the original so people can make the connection between the two (right down to recreating the sticker which appeared on numerous classic Arthur Lyman LPs), but there are also enough differences to let it stand on its own. Here’s hoping this isn’t the last we have seen of this group. Special thanks to Dionysus Records for use of the image!